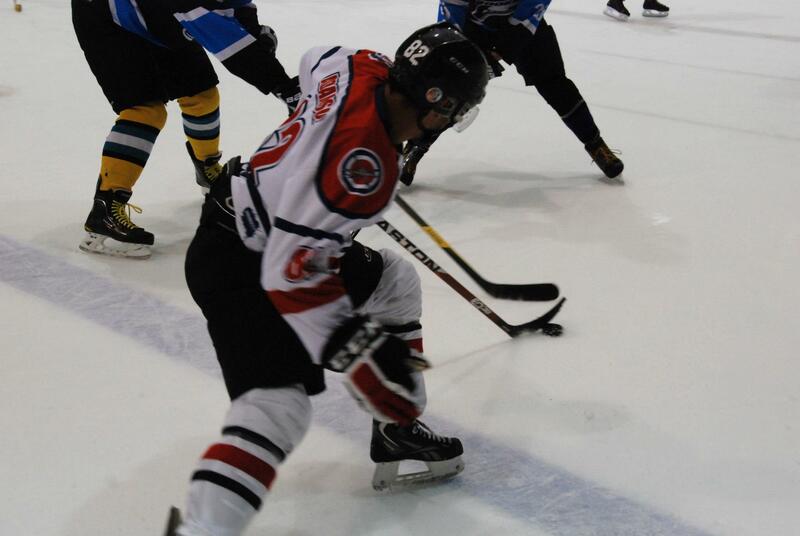 Ceptors’ captain Jake Adamsons fights for the puck on Friday. Four days later and I’m still smiling about Friday’s night’s game. It was the Interceptors versus a scratch Rookie team, containing lots of my hockey mates, and also my younger son, Mackquist, who continues to improve so that he’s able to join in a match like this, and leaves me excited that we’ll probably be able to play in a team together next summer. Friday was just one of those games that is played in a fantastic spirit, with everybody going as hard as they can but with smiles on the ice. It was only a practice match; all of us trying to get our legs back, our game sense back, our hockey sense back before summer league starts again (10.30 pm, this Thursday, for my team). I’d put in a big training effort since returning from the summer holiday to Lorne and Tassie, and since I decided my dodgy knee would survive being on the ice. The week before last, I was on the ice, or in off-ice hockey-dedicated training, for at least two hours each night, every night but Tuesday. 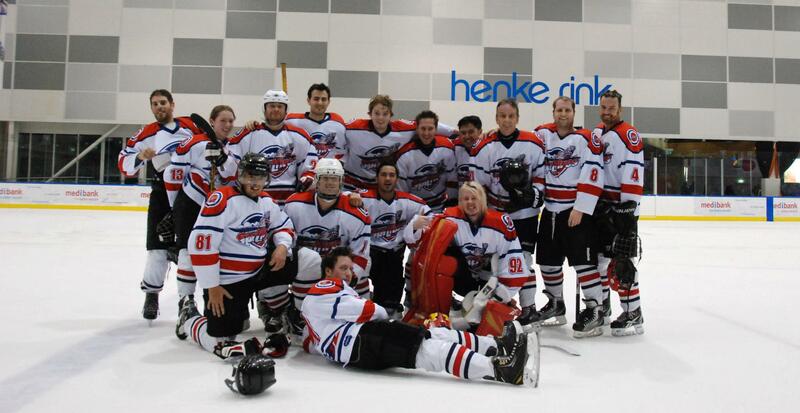 I joined a new initiative, the Icehouse Hockey Academy’s summer program where Melbourne Ice star Jason Baclig, and one of my usual coaches, also a Melbourne Ice star, Matt Armstrong, put us through our paces. It was challenging, doing skating drills, having every weakness in our stride and leg muscles pinpointed by Jason, who skates like you can’t believe. Jason hadn’t coached us before and it was great to get a new take on how to improve. Just little things like getting us to skate blue-line to blue-line on one skate, crouching. Then having us do it again on both skates, which was easier, and felt so much easier after the one-skate. Confidence builds, just like that. Then he and Army took us up to the Icehouse gym for a hockey-specific strength circuit. In the middle of all this, I continued my own return to upper body training at my usual gym in Fitzroy, and had a practice game against an IBM team, and took part in some Jets training sessions – learning new moves from the wider club’s coaches. All in all, the hockey cobwebs were blown away in a big way, to the point that in the final sprint lap of that Jets training session, skating along next to coach Scotte Giroux, my body hit “empty” and I simply lost my ability to skate hard. In the course of half a lap, I went from next to Scotte to barely moving. Petrol… gone. It led to a quiet week last week, knee hobbling again – Magic Enzo, the osteo, finally doing some magic – until Friday’s game, by which time I was bursting to hit the ice. And it was a blast. A total blast. A reminder of everything I love about playing hockey. Early in the first period, Big Cat, at speed, won the puck on the right wing, looked across the width of the ice, saw me charging and dinked a perfect pass through the air and over two opposition sticks so that I skated onto the puck without breaking stride. Through the blue line and clear, although the defenders were closing. 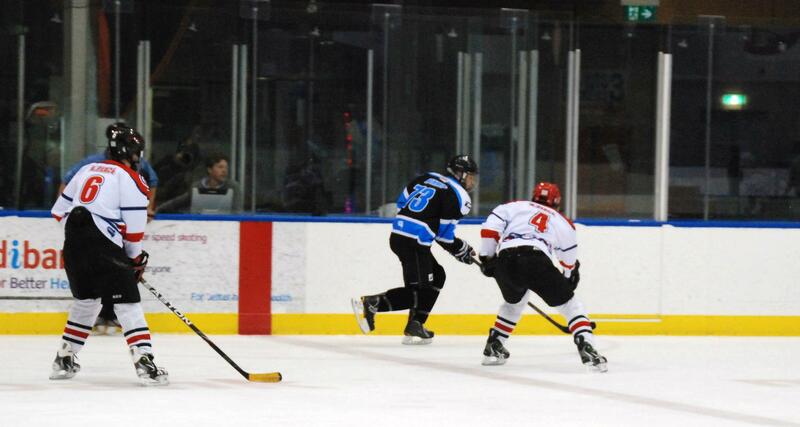 Me travelling fast (for me) and winding up the wrist-shot. That glorious feeling of seeing the puck disappear through the five-hole, as the goalie dropped but a fraction too late (sorry, Stoney). Interceptors whooping and hollering. A glove-pumping celebration glide-by past our bench. Then marveling, in the second period, as our captain, Jake, got the puck on the defensive side of the red line, out of the corner of his eye saw an Interceptor player coming over the boards, half a rink away, and duly delivered an almost-blind pass right onto the stick of Big Cat, motoring away from the bench. That left Big Cat all alone with the goalie and his finish was clinical (sorry again, Stoney). The Rookies had many decent players and scored three goals going the other way, but the Interceptors eventually prevailed 4-3, on the back of a second goal from Big Cat and one from our coach, Will Ong. I don’t mean to give a match report as much as to convey that it was just a fun, end-to-end game, where we Interceptors felt ourselves click as a team, even if we were missing a bunch of players through travel and injury, and had coach Ong and Mark “Happy Feet” Da Costa Caroselli as one-off free agent players. Our defence was calm and measured, working together and playing smart hockey. The forwards, me included, were charging at every opportunity. Yesterday, at Lorne, Big Cat and I were still grinning about it. And so I thought I should share that joy on the blog. As a counter to all those posts where I doubt myself and the journey. It’s good to stop occasionally and just celebrate the joy of playing. So this is a salute to the sheer joy of playing with mates and against friends. The fun of good-naturedly bantering with an opponent who has just scored a great goal; both of you hunkering down for the next face-off. The fun of skating as hard as you can to try and go with somebody who is better on their legs than you are. The satisfaction of scoring a goal, or of nailing a good pass to a teammate’s stick. All those little one-percenters, all that sweat, all that effort. The satisfaction of an intense, hectic, brilliant hour. Icehouse classes (dev league and power-skating) start again on Wednesday night. Thursday, we play the Champs, who smashed us last time. I play hockey. For a team. Like I dreamed of, crazy dream that it was, two and a bit years ago. I’m definitely getting better as a player and a skater, bit by bit, skate by skate, game by game. And I love being a part of it, win or lose. Friday’s winning Interceptors line-up. I was so happy with the win and the game that I didn’t even care my post-helmet hair looked like Milton the Monster. So there. Pic: Dave Walker.